- Ceramic honey pot handmade by Jonathan Harper from Harper Pottery (Waterdown, Ontario). 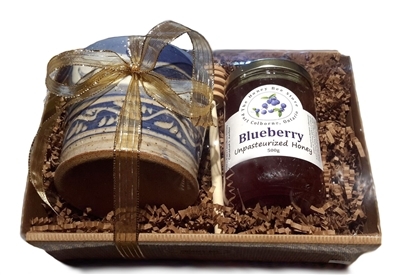 Wildflower honey, Blueberry honey, Summer Blossom honey, or Buckwheat honey. The colours of honey pots may also vary. and choose your favourite honey pot (by Harper Pottery ONLY). these pots are just beautiful. the honey is superb and I gave these as gifts and everyone was thrilled with their beauty and taste.